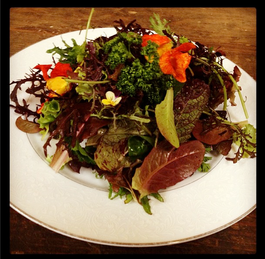 Our signature mix: a blend of baby lettuce, spicy Asian greens, and a stunning assortment of herbs and edible flowers, including basil, fennel, chervil, nasturium, borage, pansy, and calendula. 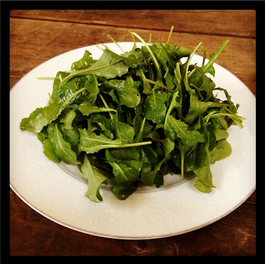 Not your typical spring mesclun! 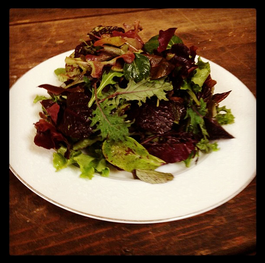 Our own unique blend of baby lettuces and spicy Asian greens. Dress it up as you like! 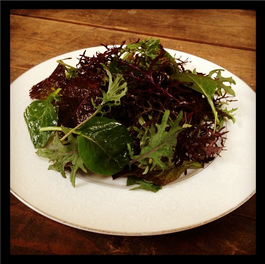 Includes tatsoi, arugula, red mustard, mizuna, red russian kale, curly cress and amaranth. This makes a nice spicy salad, or can be lightly braised or sauteed. The classic Italian salad green, on its own. Makes great pesto! 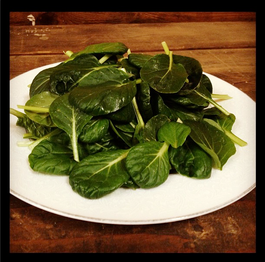 A flavor and texture somewhere between spinach and boc choy. A great mild mustard green for salads, or use anywhere you would spinach. Great for juicing and cooking with because there's hardly any prep (no thick stalk to devein, no chopping). A beautiful, toothed, colorful leaf all on its own. Our produce is available for retailers through our local distributors, Regional Access and Finger Lakes Farms. For more information, e-mail us, or call/text 607.342.5890.